NOTE: There are some refinements in instructions for trainers initiating blessing givers on this broadcast. This is an update from the original instructions on November 28 in Italy. The instructions are in Answer #4. Watching the video starting at 9:45 minutes into the recording will give the visual demonstration. 1: What’s your vision about the future and what role do you see for any of us, the trainers, the blessinggivers, the organisation of Oneness Holland? 3: Some oneness trainers and blessing givers are still intensely immersed in getting their own process right. And now you are telling us that from 2010, Level 1 and Level 2 wil be done by the trainers. How can we realize oneness so fast in this condition? 4: When can the Trainers initiate people to become Blessing givers: in 2009 or 2010? Q1: What's your vision about the future and what role do you see for any of us, the trainers, the blessing givers and the organisation of Oneness Holland? A1: Yes, it is important to understand that Oneness is a phenomenon which took birth in the year 1989. The phenomenon has been growing ever since. Now what is required is the dissolution of the organisational structure of Oneness, which means: people all over the world must take up the work. People in their respective countries, the blessing givers, the trainers must take up this work. So as the first step, from December 3rd 2009 after sunrise local time, the Oneness trainers would themselves be able to initiate people into becoming blessing givers after their course. They have this two days Oneness Experience course, that course they could conduct minus the video but assimilating the teachings into their own life and coming from their own experiences they must expound the teachings and then give a special initiation which we will be teaching you and then and there they will become blessing givers. They don't have to go to Italy or Fiji or India to become blessing givers. That is the first step. Then progressively we would like the trainers themselves to conduct other courses like Level 1 and Level 2, except Level 3. All other courses they should gradually learn to conduct themselves in their own countries. Level 3 alone would be an interaction between me and you, where I'm talking to you about spiritual matters, that is Level 3. That will go up until 2012 or at last 2014, thereafter that too will stop. So your role now is to have more trainers so that you could produce more blessing givers in the year 2010 and 11. 2012 is the year of action, that is the most crucial year when we will be getting into the process. In 2012 groups of blessing givers, small, medium, big could be formed all over Holland. 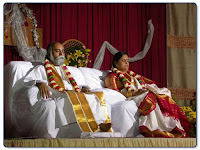 And these people they must start giving deekshas to each other in a very special way which we will teach you in the year 2012, for example in the month January there could be 4 such events, that you will be giving blessings to yourselves; I will be participating in that. It would be stepped up in the month of February, March, April and in December 2012 every day I will be meeting you and every day you will be giving blessings to each other. That is the month of December 2012, when that happens collectively, not individually, collectively, you will be moving into higher states of consciousness. Whatever kind of consciousness you have been attracted to, or you have been desired, for example Christians would enter Christ consciousness, Buddhists Buddhist consciousness, Hindus Hindu consciousness and Muslims Islamic consciousness. These will not be the same, they will be very different from each other. That is why this movement is not called Sameness, it is called Oneness. But the strangest fact is though the Christian would move to Christ consciousness and a Buddhists would go to Buddha consciousness or a Muslim Islamic consciousness their experiences come together as one. Though they experience very different they will come together as one. So 2012 December this should happen, 2013 and 2014 we may hanging on to stabilize things. After 2014 Oneness is completely dissolved and all of us we go away to lead our simple, anonymous lives only to be forgotten. Because we do not want to perpetuate ourselves. If that happens Oneness will be destroyed. Oneness is not a concept, it is not a belief, it is a living experience. It should not express by thought or by people. So we live on and fade away, that is our plan of action. So shall we move on to the second question now? Q2: How could we deal with the pain and insecurity that we feel now because of the situation in the Oneness organisation? A2: This situation has arisen because we have initiated a process of dissolution, that is what have led to this kind of situation and in the coming months and years we will be speeding up that dissolution and as we finally completely will be dissolved, there will be no more pain what so ever. As long as Oneness remains an organizational structure this kind of things will be happening and this kind of pain will be there. So as we dissolve ourselves the big ....... disappears so wait for the final dissolution. The next question please? Q3: Some Oneness trainers and blessing givers are still intensely immersed in getting their own process right. And now you are telling us that from 2010, Level 1 and Level 2 will be done by the trainers. How can we realize Oneness so fast in this condition? A3: The phenomenon is closely observed in India and ever since 89 the phenomenon has been growing and we have gotten in times is growing by the week and we believe that in 2010 it will be very powerful, more powerful in 2011 and very, very powerful in 2012. So we believe that things which took a long time earlier could be done much faster. We have the experience with Indians now and we believe that will be the same also with Westerners and please don't forget what (name) a great Buddhist teacher ..........had said : "It is when the iron bird flies in the air awakening or enlightenment would happen in less than 3 minutes. That could be an exaggeration of course but the time has come, the iron bird has been flying there for quit some time now, so that time has now come. The things are moving dramatically faster, but that needs decentralization and dissolving of structures. What is holding back the phenomenon is the courses and the fee structure. When the courses are reduced and the fees cut down you'll find the phenomenon be growing very, very fast. That is the step we are taking now. For example if you are to come for a Level 1 to India it would just cost you 700 dollars. That is there will be no course fee at all, you will be only paying for the food, the accommodation, the laundry and internal transport. Now the same thing I belief if you go to Italy I think it would cost you more than 3000 dollars, that is what I understand. But here there are even cheaper things that we are launching also, it is almost free.. so the money factor is been removed very, very fast. 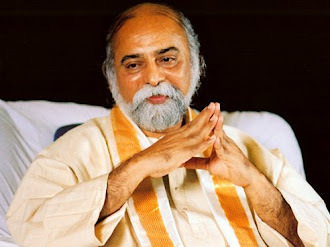 Onno: Bhagavan, there is a question from a blessing giver , is it okay if he asks it? Answer: O, yes, perfectly okay, go ahead. Q4: Harmen, maybe you know him, Harmen, trainer, Harmen? He asks if it will be possible for the trainers to initiate people to be blessing givers in 2009 or in 2010. A4: "No in 2009, December 3rd, I told you, after sunrise you can start initiating people. Shall I demonstrate you how it should be done?" (Yes yes, from the audience). "Yes!" Bhagavan points and asks: "Do you see this head" (Laughter from audience and yes, yes). 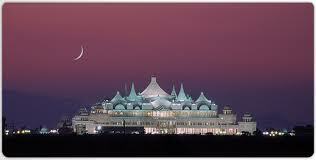 "There is a spot called bramasthan , it is a spot on the middle of the head. You must have seen small babies , the center of their head is starting as soft bone when born, which hardens, that is the spot So you take your middle fingers, put them together on that spot. First relax the person and you be relaxed. Put the middle fingers at that point The other fingers can rest on the skull The fore fingers must be like this and the thumbs like this), a bit like a pyramid. Now invoke that Divine Being which whom you have contact. If it is Christ you invoke Christ, if it is a Hindu God you invoke that Hindu God, if it is Allah you invoke Allah. Now the way you should do this is to pray to Christ or Allah, asking them to enter this person and to make him into a Blessing giver. You should repeat that prayer for three minutes. If you do not have a connection with anyone of these Beings then you can connect to AmmaBhagavan . Whether you connect or not, you should invoke AmmaBhagavan, we will come; you do not need to have a connection with us for coming but to other Beings you need a connection. But keep repeating that for three minutes. Then gently touch the blessing givers head with both your hands, just for a minute or so, then take them out, and then after 10 or 15 minutes he must go and give blessings to the others, maybe five people, 10 people, he must bless them, and then he must repeat this for the next few days, and then you'll find that all this is going through very , very beautifully and once he gets this conviction it will go much, much faster , and this will be very fast in 2010, faster in 2011, faster in 2012. So all trainers in Holland, because we will be activating something here in you like a remote, grace will be flowing through you. So after sunrise in your country you are going to start it, say now and here from December 3rd. You don't have to wait any longer at all. To become a blessing giver you don't have to go to Italy or Fiji or India. And what charges you will fix up is completely your affair. You will decide in Holland, nobody will dictate this to you, nobody will write. I want to make one request that for people who can't afford it, it should be given for free. But technically this can not be given free because the karmic cycle must be complete. Therefore the poor person must at least offer you a small flower, or a gift, or whatever is given to him. But if they are middle class, lower middle class, upper middle class you can fix your own tariff, it's up to you. So we don't want to dictate terms on that. So you can start straight away December 3rd. That is the answer to that question. Onno: Thank you very much Bhagavan. We are very happy with this, because it will speed up the process of bringing Oneness to Holland very fast. Thank you very much. Bhagavan: So shall we now meditate for a few minutes, three minutes.